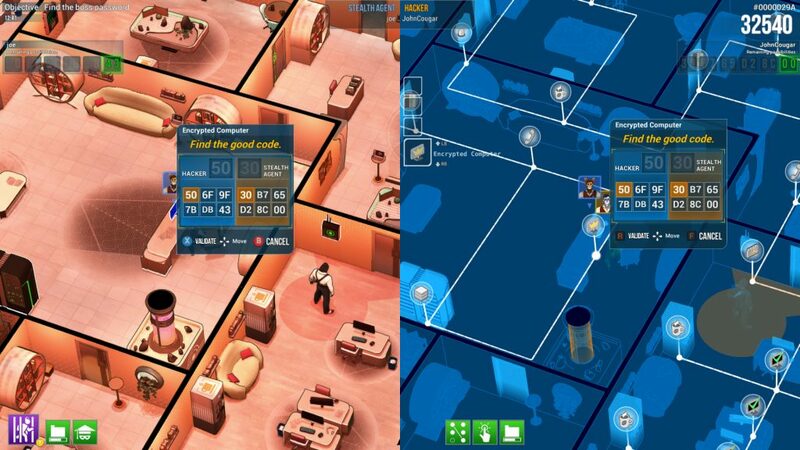 Hacktag is a wonderfully fresh take on co-op games, combining the challenge of solving a cooperative puzzle with the entertainment of being a Top Secret Super Spy. 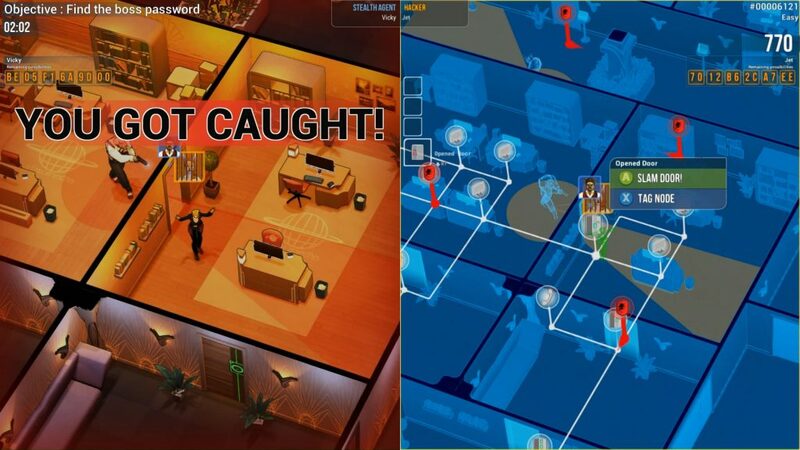 The game puts you in the shoes of a Hacker or Stealth Agent, each uniquely geared towards the operational goals with special abilities that work in cooperation with one another. The thoughtful and methodical gameplay make for some exceptionally tense situations, but unfortunately these get mired longer into the experience, with repetitive quests turning the thrill of early heists into a fairly mechanical procedure. In Hacktag your primary goal is to steal important information from different corporations, offered to you through several types of assignments which ultimately play out in similar fashions. The game is set in a parallel world in the year 2029, where the secrecy of evil corporations has necessitated the rise of ______, a group with the goal of breaking into these companies and extracting their valuable data. There is a minimalist story to the game, with each quest providing a short amount of dialogue specific to the mission. While each quest archetype has a different set of objectives — some are basic data collection while others require to crack a password by pulling data off other machines is certain orders — they largely play out in the same way. The Stealth Agent are your boots on the ground, opening up the network lines and physical access points that are necessary for the Hacker to work their magic in the system. The missions consist of both players working in tandem to open access ways and dodge both physical and system-based threats to make their way to the final objective. The game, despite its sinister nature, features a colourful and cartoonish isometric design, which fits the style of gameplay very well. Each player controls a customizable anthropomorphic animal, including foxes, cats, and dogs, with a selection of different designs and fur patterns to choose from. Players can also choose one of many outfits, and a number of accessories like hats and glasses to accent their avatar. You can play Hacktag on your own, switching at will between the two roles, but we found it to be much more satisfying when played cooperatively. Playing solo presented its own challenges — like ensuring you didn’t leave your Stealth Agent out in the open while hacking — but in many ways it was much easier because you did not have to be coordinating with another actual living person. This is the challenge, and most assuredly the fun, behind Hacktag. It’s also possible to play Hacktag with two people on the same PC, opening up the possibility for some couch co-op action. Gameplay largely depends on which position on the team you are playing as, and you may find that you prefer one role over another. I tended to play as the Agent, while my partner Josh Crete was my cyberlink to the network. The Agent plays with a top down view and 360 degree movement in an isometric map. The map is full colored and littered with security guards to avoid, each with their own cone of vision, making it easier to predict your safe path. Aside from the numerous obstacles to breach, there are also security camera that the Agent must dodge, unless they have a capable Hacker who can disrupt them. The Hacker screen is similar to how the Agent views the world, with a blue tint and overlaid with white grid lines that dictate the available portion of the ‘network’. Much like the Agent, the Hacker has to deal with security, only it comes in the form of Virus Protection and Intrusion Detection Systems that bounce between nodes or highlight entire sections of the system until the Agent can shut it down at a physical point for a short period of time. 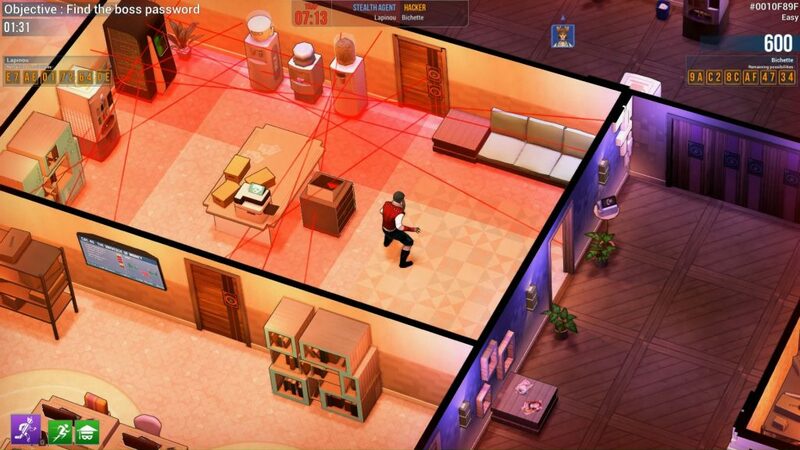 Both players can get caught by suddenly spawning laser grids, which will trigger an instant alarm and force players to dodge them while being locked in the room alongside the beams. As you make your way through the world and towards your final objective, you can come across other computers that you can hack to download your data and increase your score at the end of the game. Your score ultimately determines your rank, and we found that a combination of expediency, hitting every extra computer, and ensuring that one another were not caught by security systems was the key to a perfect rank. If your hacking partner does get hauled off by either security guards or the Virus systems, it’s fairly simple to track them down and break them out with a little button-mashing. At the end of each mission, players gain experience and will invariably level. Leveling up does little overall but provides a ‘Lootsafe” that can be opened for…you guessed it! Loot! 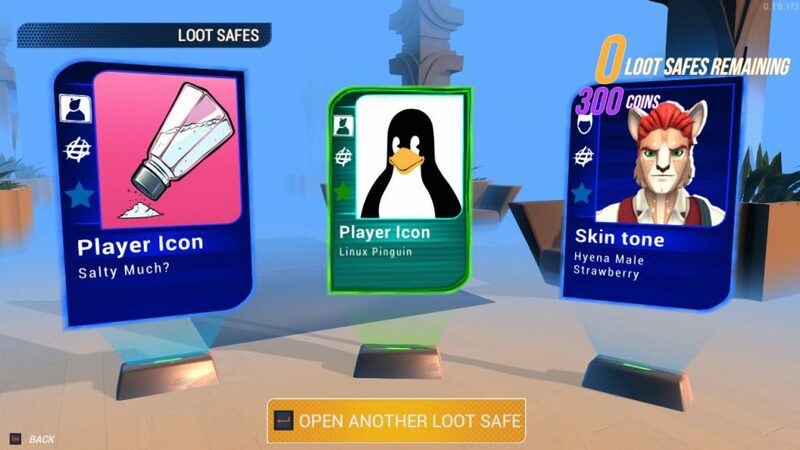 As you may have suspected, you open these crates to obtain three random cosmetic items or in game currency which can be used to unlock other species designs or cosmetics features. While the customization was initially bugged at launch, causing the majority of the selected items to not actually equip on your character, I found that shortly before publishing it was working well. The problem is that the formula gets repetitive after more than a couple of hours of sustained play, and aside from cosmetics the game doesn’t feature an impressive array of unlockables that would otherwise keep me playing a bit longer to secure that extra Lootsafe. Where Hacktag makes its comeback however, is that it is a great game to come back to after a short break for some corporate espionage with your trusty Hacker. Not every game is meant to be played in sustained sessions, and HackTag is best served up in broken up sessions. While the game itself functions without any problems, we had some minor networking issues while trying to connect to matches where the game would freeze while loading into a match or not let one of us join a party. That being said, all it took was a quick restart when one of these problems surfaced to solve it, which was a small handful of instances. Hacktag was a lot fun to play in short bursts, and even better to play with a good friend; combining action-puzzlers with simple hacking mechanics to steal as much information as possible from corporations and laughing at the silly mistakes one another would make all along the way. I feel like the game would function well on console as a couch-coop game, because it was really at its best when sharing a laugh and a heist with a partner. 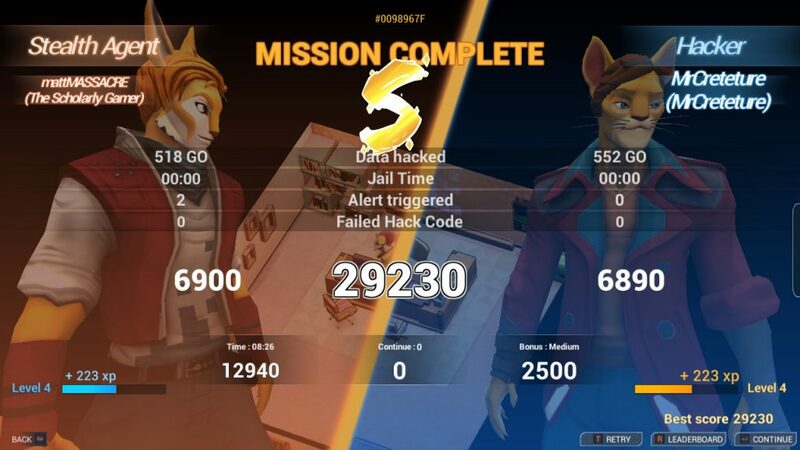 I can see myself coming back to Hacktag occasionally to try and better my scores and perfect my heists, but if they want to secure the long heist there needs to be a little more in the vault. Hacktag’s cooperative playstyle is a refreshing take on puzzle-based gameplay, but like many heists it has a hard time perfecting the long-game.